Simone Boilard will make her professional debut in 2019, having signed with TWENTY20 Pro Cycling to launch her professional cycling career. Boilard is one of Canada’s rising talents, showing another year of improvement. 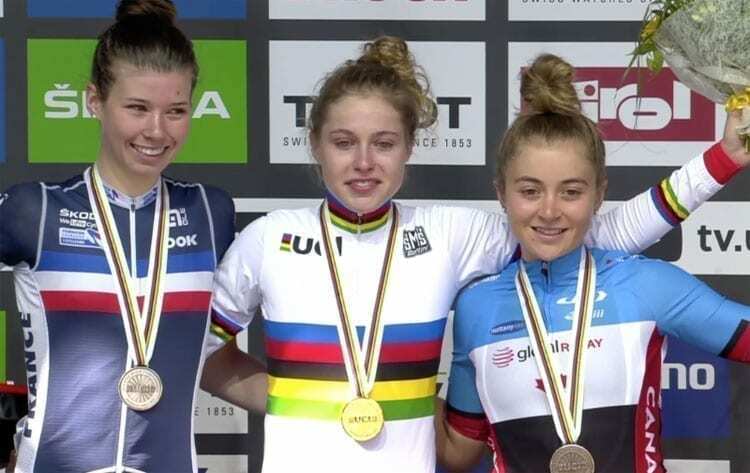 Boilard has made the steady climb through the junior ranks, closing out her junior racing earning a bronze medal in the hard fought junior women’s road race at the UCI Road World Championships in Innsbruck, Austria and a strong 5th place in the individual time trial. Boilard showed composure and consistency as well as power and strength on the world stage last month, proving she has the skills and desire for the professional peloton. Boilard lives in Quebec and grew up with a “beat the boys” attitude. Determined, focused and a love for being outdoors, Boilard found cycling balanced well with skiing in the winter and the competitive fire was lit. Boilard has made improvements each season, both in her strength and also in her fitness adaption. These calculated improvements are instrumental to a developing female athlete. Boilard continued the progression this season, improving on her 8th at the 2017 UCI World Championships in Bergen. “I very happy to be included on the TWENTY20 roster. I believe I share the same values as the team who is always looking for excellence and hard work in both sport and academic domains. I chose TWENTY20 program because I believe that it provides a great learning environment for me. Providing great mentors and role models inspires an ideal environment for women cyclists. Their knowledge will help me reach the highest level of cycling by giving me the opportunity to do a progressive transition from Junior to Elite,” said Boilard. Boilard will have the opportunity to work on her tactical and technical skills and gain valuable race experience. With a balanced roster of young talent and experienced leaders, the set up is ideal for Boilard, who will also continue her educational goals. “In my family, education has always been a priority. My mom was a high school principal for many years and now she is directing a school board. I love bike racing because it is my passion. I am aware that there will be a life “after bike racing”. This is why I am doing full-time Cegep online. I am very self-motivated and it requires a lot of discipline but it’s also a great challenge. Plus, I always have something to do when I am on the road waiting for the next training ride or race,” added Boilard.